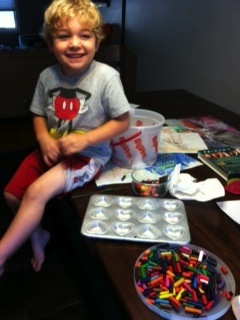 If you have a child like mine, all those nice new crayons end up broken in half before they are even used! 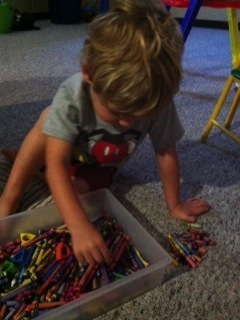 Thanks to my neighbor, Janice, we found something to do with those little bits of crayon. 1. 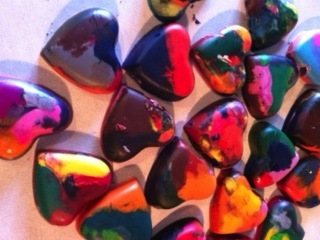 Find all the broken crayons. Take off any wrapper. Break them into smaller pieces if needed. 2. Place several in a baking tray. 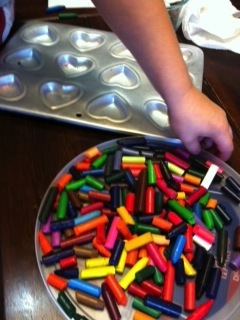 We used my neighbors cute little heart tray. 3. Bake at 200 degrees until melted. About 10 minutes. 4. Let cool and then pop out. Hint: My first batch didn’t come out of the pan easily, so I really greased the pan the second time. I just remelted my failed attempt on they turned out great! 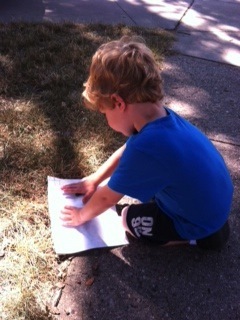 We took our new crayons outside and did impressions around our neighborhood! We even gave some to our teachers! My Kindergartner said that if any kids break them they have to go to the principal!! Yep, they are that cool!. Have fun, and thanks for the idea Janice!